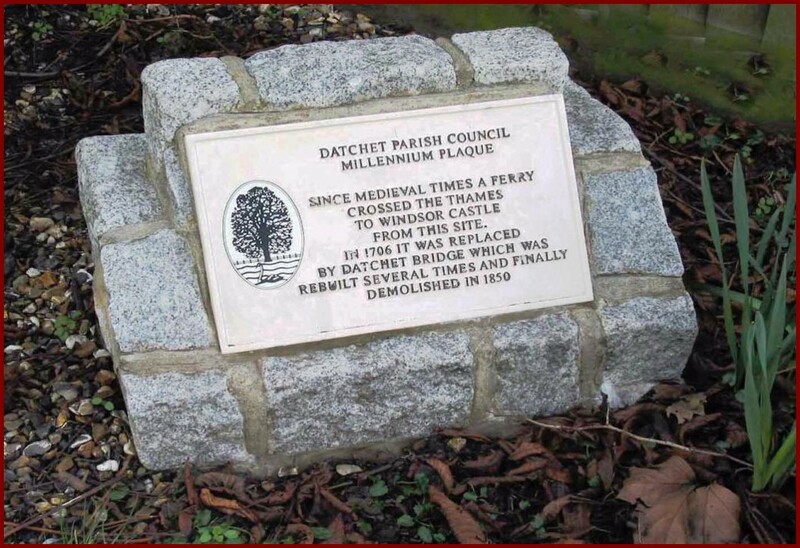 Datchet had been an important Thames crossing point since Windsor Castle was built in about 1100, and the ferry was paid for by the Crown. From 1249 there are records of timber being provided to build or replace the ‘great barge for the King’s ferry at Datchet’. It is likely that there had been a crossing point here much earlier, and that Datchet itself had developed because of the route from the ferry and on towards London. The castle land on the other side of the river has been made private only in recent times, and the public tow path was on the castle side. By about 1500 the right to lease out the management of the ferry (and profit from doing so) belonged to Datchet Manor, which was then owned by the Crown. 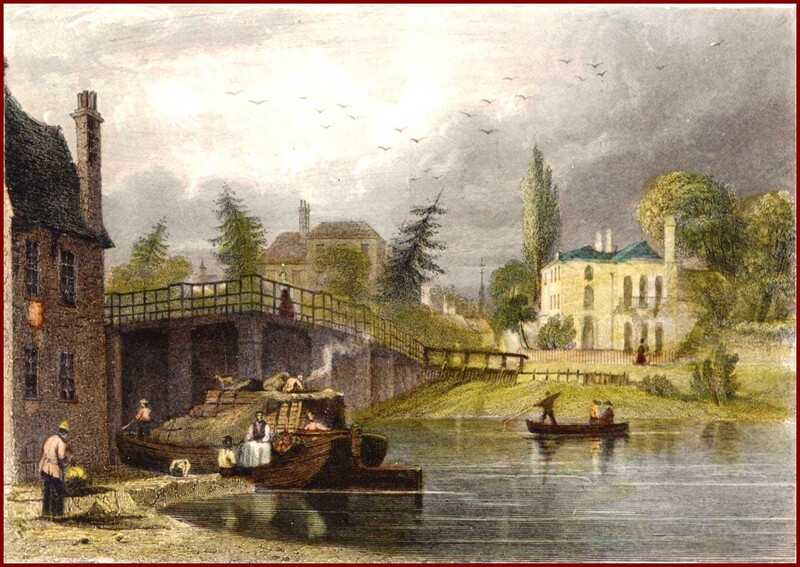 The ferry was used by the royal household as a faster, more private, and sometimes as a secret route towards London, rather than using Windsor Bridge and the road through Eton and Slough. This is the earliest image of the ferry, drawn in 1686. By this time it was little more than a raft but capable of carrying horses as well as foot passengers. It was operated by the ferryman heaving on a rope or chain which could be dropped to the river bed so as not to obstruct boats. The tow path ran along the far bank to enter Windsor town by Datchet Lane, while another path led directlyup to the castle. 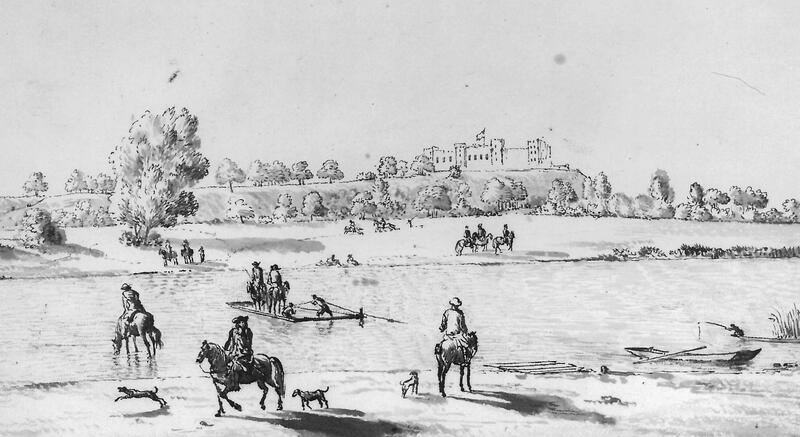 King William III had planned to build a bridge to replace the ferry as part of his improvements to the castle access, and had begun the felling of trees to do so before he died in 1702, but it was completed by Queen Anne in 1706, ‘for the better convenience of our passage from our Castle at Windsor’. 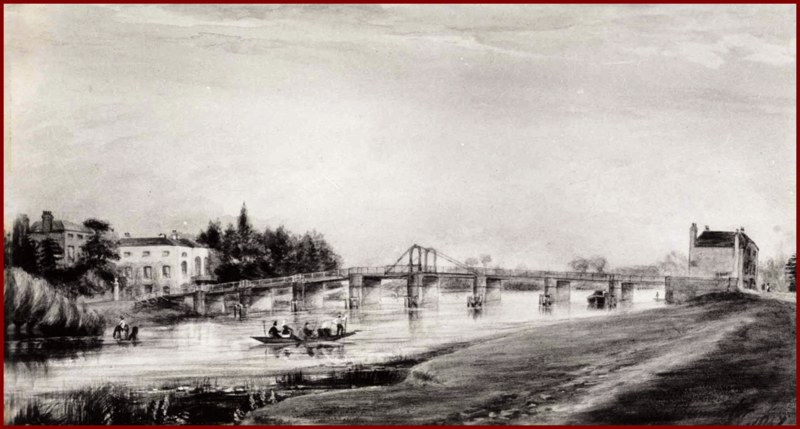 It was provided as a toll-free bridge which caused a problem for Windsor where bridge tolls were charged, because Datchet Bridge began taking much of the traffic and the town’s revenue suffered. Compensation was paid by the Treasury to Windsor, but not to Maidenhead which also complained. Partly due to such heavy use this first Datchet Bridge was in constant need of repair. 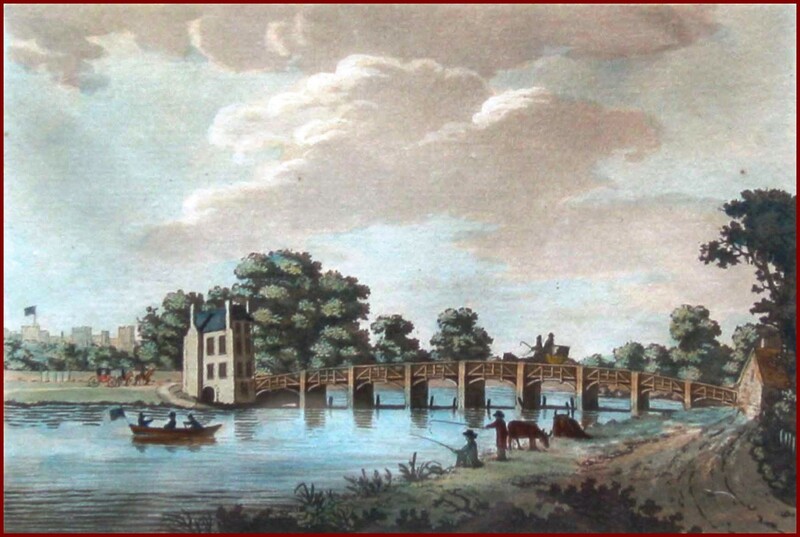 This is the only image of the original wooden bridge, but the print dates from about 1780 by which time it must have undergone repairs and alterations. The view is from the Datchet side, the cottage in the foreground probably being on the site of Datchet Lodge. The bridge rose from the foot of the High Street, so the modern public riverfront is on the site of the natural sloping bank at right of centre in the print. 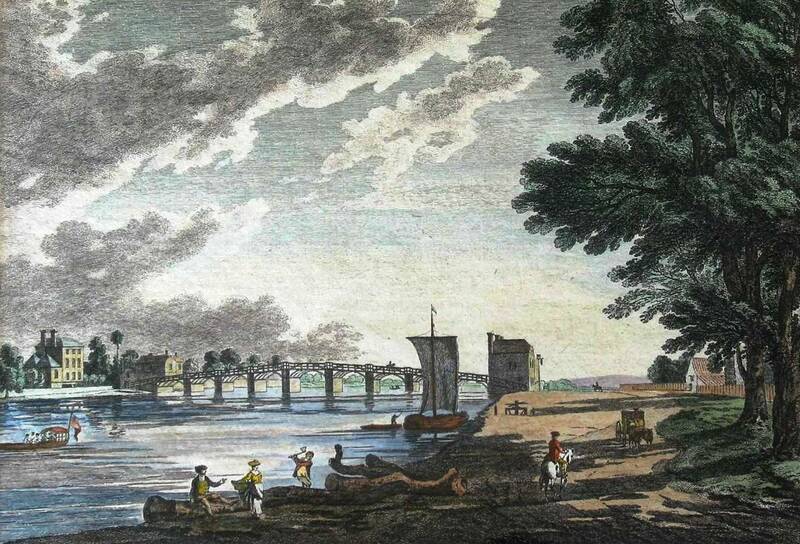 In 1770 the Crown paid for completely rebuilding the bridge, this time using substantial brick and stone piers (which lasted very well) to carry a wooden roadway or deck which constantly needed expensive upkeep. Although these three images are very different, they are all of the second bridge. That by the unknown artist is from the Datchet bank, the other two from the Windsor side. The houses shown at the bridgefoot in Datchet are Datchet Lodge and Old Bridge House, while on the castle side there was a pub called the Crown and Angel which no longer exists. 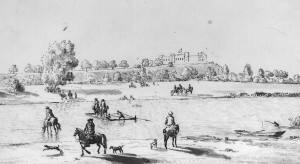 Sandby’s picture shows the wide tow path beside the river on the castle side. 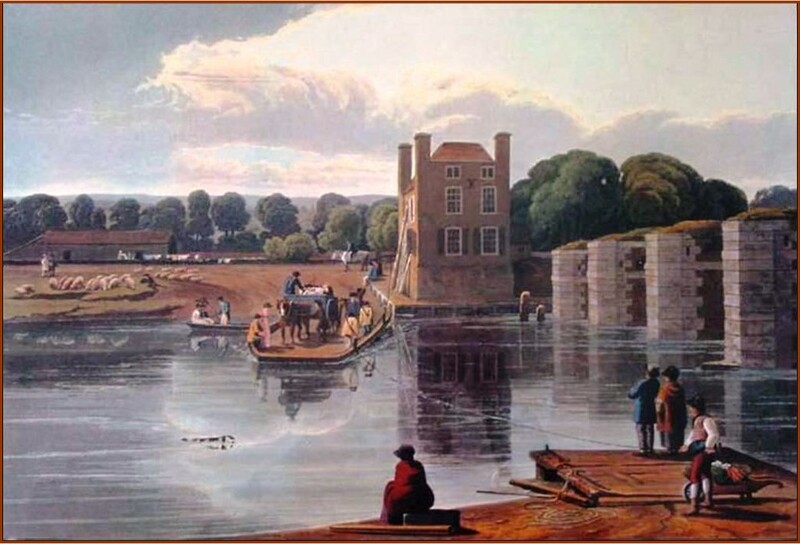 Following severe flooding in 1794 the deck finally fell and George III refused to pay for it to be rebuilt again, although he did provide a free ferry service alongside the piers (which remained in midstream) until the problem was solved. The problem was that the two counties whose boundary ran down the middle of the river could not come to an agreement; Berkshire on the Windsor side and (until 1974) Datchet was in Buckinghamshire. Both denied the responsibility, which would otherwise have fallen on them, because Queen Anne had originally paid for the bridge to be built. In 1801 John Richards of Datchet, lay Rector and contentious lawyer, took both counties to the Court of King’s Bench for failing to carry out their duties. Both were directed to pay half the cost of rebuilding each, reusing the old piers, although Berkshire had proposed a more progressive plan to erect a new bridge further down river in iron or stone. Because it had always been toll-free, permission to charge tolls to pay for this more expensive option was refused. 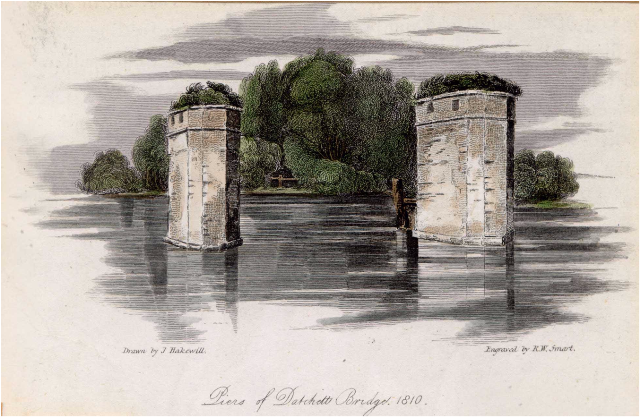 The bridge was eventually reopened in 1811 to rejoicing in Datchet where much depended on through trade across the bridge. 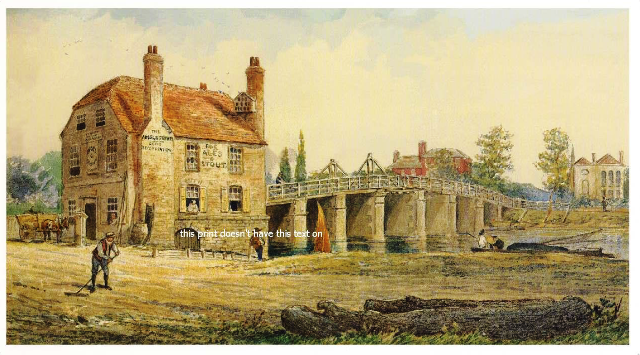 By 1834 the deck was again unsafe and even worse antagonism broke out: since the two countis had agreed their boundaries ran through the centre of the bridge and it was only the Bucks side that was in need of repair, Berkshire declared that they were only responsible for their own half and not for half of all repairs. At that point Berks’ own side was in danger of falling and that county wanted to build in iron instead. By 1836 a temporary ferry was once more in action while the two counties began rebuilding from their own sides: Berks in iron and Bucks in timber. As the workmen approached each other in the middle arguments flared and injunctions were obtained, until the Lord Chancellor ordered both sides ‘to proceed without impeding each other’. So the final bridge became an extraordinary structure with a gap in the centre of the deck where the two sides didn’t quite join; luckily it was only to exist for another fifteen years. The uneasy join can best be seen in the Chapman image below; the colour version was found recently and is presumed to be a copy of an unknown original of which we only have a b/w photograph. 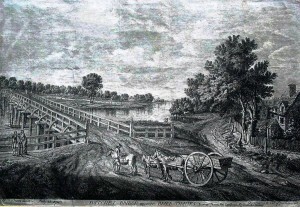 It is certain that the colour picture is no older than the 20th century, and it is a slightly inaccurate version of the original: in the b/w photo the advert on the side of the Crown and Angel reads ‘Good Stabling, Two Minutes from Datchet Station’, but this has not been copied in the colour version. 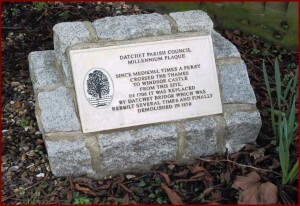 It is a crucial detail because the railway’s arrival led to the final demise of Datchet Bridge. 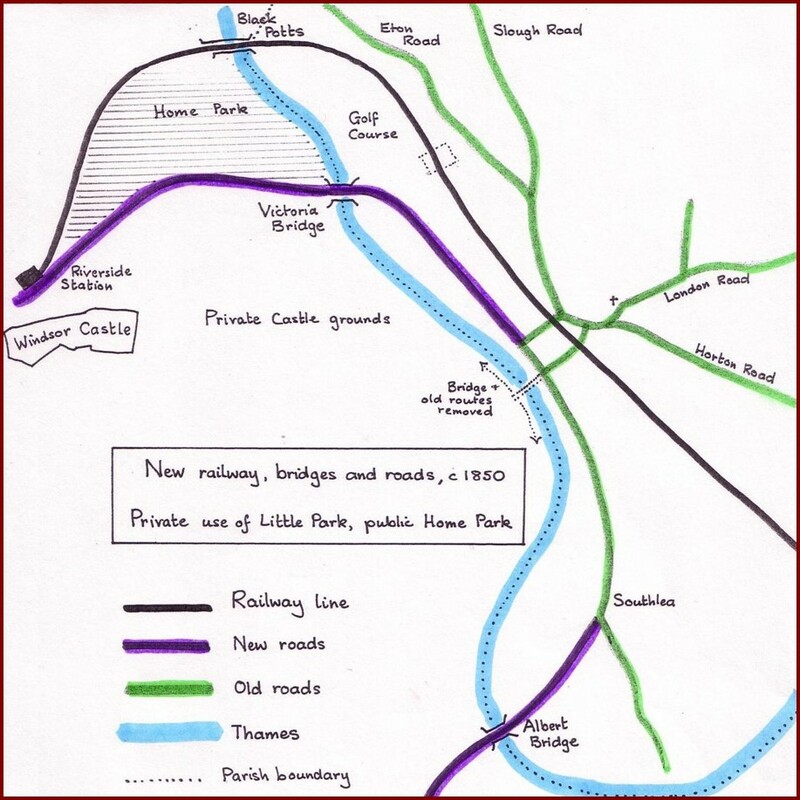 2) Two bridges were built above and below Datchet (Victoria and Albert) to carry two new roads (purple), to Windsor and Old Windsor, so that the old Datchet Bridge could be demolished and public access to the castle grounds ended. 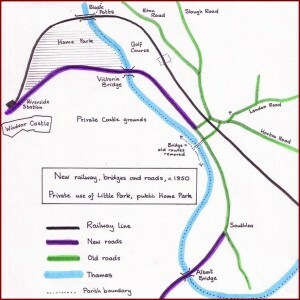 3) A new public area of the Home Park was given in compensation for closing the castle grounds, between the rail line and the new Windsor Road. 4) There was no old road directly from Datchet; Windsor Road was a completely new route. 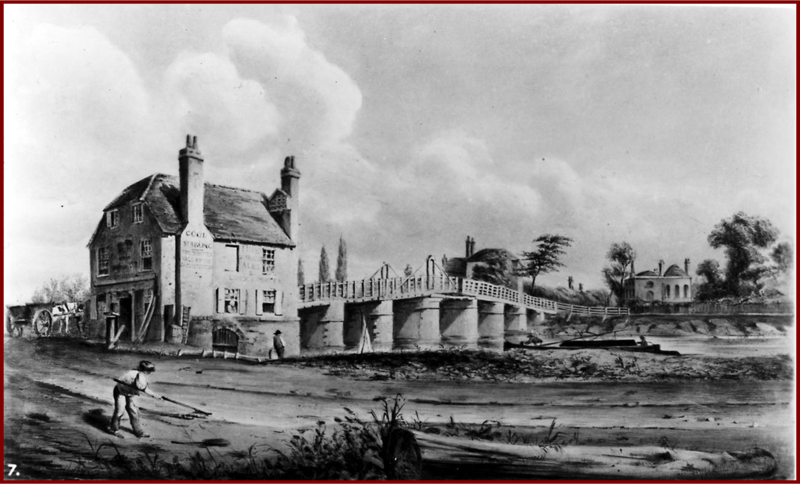 6) Once all the development was in place Datchet Bridge was demolished and the materials were advertised to be sold in 1851.